To manage, enrich, consolidate, clean up and share fragmented data from various applications in your organization in a structured way. The Oracle Product Data Hub allows you to manage, enhance, consolidate, clean, and share fragmented data from a variety of applications in your organization in a structured way. The integrated collaborative tools enable you to share your Master Data both within your organization and with your business partners and manage and improve its quality. 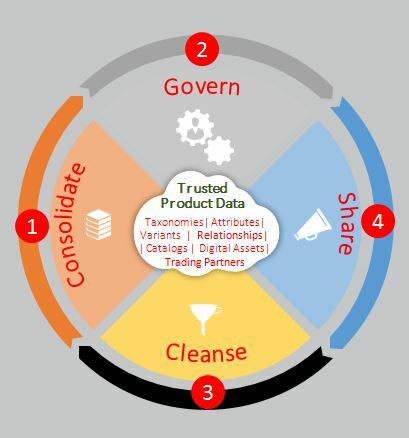 Oracle Product Data Hub provides an excellent platform for using reliable standardized, high-quality product data within your organization. The Oracle Product Data Hub will help you to effectively manage your product master data by determining, monitoring, and enforcing standards and policies in your organization relating to ownership, security, quality, and business processes. Integrated security features and roles enable you to determine who should gain access to what types of product information. You can then validate the data through the use of a solid framework containing terms regarding product definitions (including features, relationships, categories, and departments). The integrated flexible workflow provides the option to run the product definitions and change management processes within the organizational structure defined. Change management shows you which changes apply now and in the future. The integrated analysis and reporting options provide your team with essential details on all aspects of the Product Master Data. The Oracle Product Data Hub enables you to easily import product and catalog data from a variety of internal and external sources. Your suppliers can add their product information using a self-service portal (Oracle Product Hub Portal Cloud) and receive feedback which is then instantly validated. In addition, internal users can easily map data by using a drag-and-drop feature. When importing data, you can choose from a variety of file formats, including Excel, CSV, and XML. You also have the option to import GS1 data using the GDSN infrastructure, which allows you to create links to any GS1 data pool. The Oracle Product Data Hub allows you to share complete, validated and consistent product information in your own organization or with your business partners. Your users will have access to a simple, user-friendly screen which allows them to determine what product data and information they would like to publish, and to whom they wish to disclose it. They will have the option to use validation rules, ensuring that only validated data is disseminated to the appropriate systems using this data. When sharing product data, users also have access to web services and a variety of file formats, including MS Excel, CSV, and XML. All imported data is validated based on business rules, and the results of this process can be displayed in a graph, allowing your team to inspect it and solve any problems before the data is imported, so as to ensure the integrity of the data. The Oracle Product Data Hub also provides you with a rich and expandable data model in which you can document features, product hierarchies, structures, relationships, and so on. You will also find it easy to define contextual product data, which varies by supplier, sales channel, target users or location and maintain this data without the need to duplicate it.